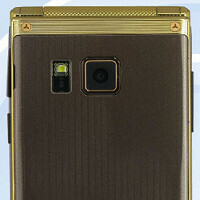 A gold colored clamshell phone made by Xiaomi, has been certified by TENAA in China. Samsung recently released a similar handset, the SM-G9198, that was powered by Android 5.1.1. Xiaomi's clamshell features gold trim and apparently comes with a removable battery. But the most interesting part of the phone's listing on TENAA is the 8GB of RAM that supposedly is inside the phone. And yes, that is RAM, not ROM. While we have no choice but to consider that amount of RAM to be a typo or mistake, the rest of the specs are more pedestrian. The clamshell is equipped with a 3.97-inch display carrying a 480 x 800 resolution. That works out to a pixel density of 235ppi. A quad-core 1.4GHz CPU is under the hood, with 16GB of internal storage. A microSD slot is on board for those seeking additional memory. The TENAA listing reveals an 8MP rear-facing camera and a 2MP front-facing snapper, although the latter doesn't seem to show up well in the photographs. Android 4.4.4 is pre-installed with Xiaomi's clamshell UI running on top, and the phone does support 4G LTE connectivity. Now that it has been certified by TENAA, we should see Xiaomi making this clamshell official soon. We expect the model will have limited availability. UPDATE: According to another source, the clamshell certified by TENAA is actually produced by a new manufacturer called Rice, which has one previous handset certified by the agency. We thank Navdeep from Mobipicker for bringing this to our attention. Lol 8gb of ram and an antique display. It must be a mistake somewhere. Wouldn't 800 million pixels (as stated on the spec sheet) be 800MP, not 8MP? Or am I reading that wrong? Incorrect translation. They were trying to translate a number that means 800 ten-thousand, or 8 million. Translate = Convert. "Translation" is for languages. It isn't a Xiaomi phone. Seems like the source confused Chinese brand names. but ....but only 1.4 ghz thts underclocked for 8gigs of ram.........CHINESE may be thts s**t Who Know? It's not a Xiaomi Phone. It's called Xiangmi. Kind of an unknown brand trying to confuse customers. for what do u need 8GB RAM on a phone? I lost trust in this information the moment i saw Android 4.4.4.